Tallinn will always remain close to my heart, even though it was a very short visit. 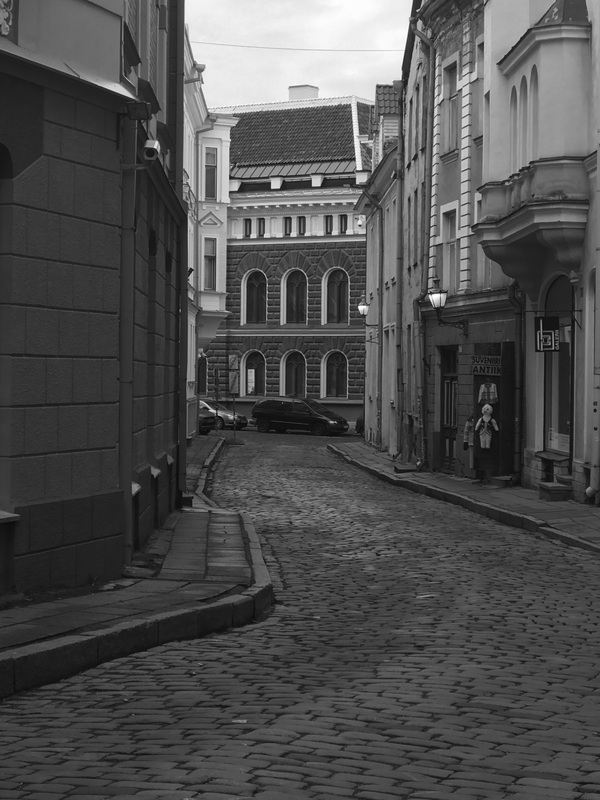 Warm people, excellent food, rich culture, and absolutely stunning architecture – with Tallinn everything was perfect. Fun Fact: Did you know that the Estonians invented Skype? After three insanely chilly days in Rovaniemi chasing the Northern Lights, and an overnight train later, I boarded the Eckeroline ferry to Tallinn from Helsinki. Braving the chilly wind, I got on to the observation deck to get some pictures. It was definitely warmer than Rovaniemi, which was fluctuating between -15 and -10 when I was there; but in reality, -4 degrees celsius is still cold no matter how much you tell yourself otherwise. Warmer than you think.. NOT! 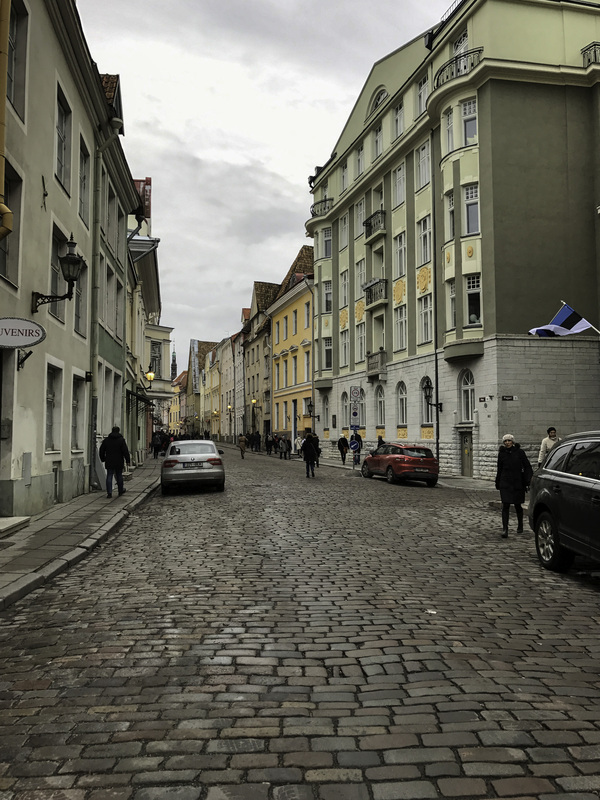 Tallinn is divided into old town and new town and it doesn’t take much to guess that I narrowed my visit to the old town. As soon as you lay eyes on the old town, you can’t help but be in awe. No pictures can do justice to it; though with every click you hope you’ve at least one picture that does. I walked my way to the other end of the old town to check into my hostel that was inside a really old building. Narrow stairs, old yellow lights, and a smell of an era gone by. The building was centuries older than I was! I checked-in, dropped my bags and ran out again. I hoped to catch some sleep and grab a bite but a walking tour was about to start from the old town square and I wanted to join it. About 1.3 million people live in Estonia, and of that 1/3rd live in Tallinn, our guide Mairi began. The first settlement came about 11000 years ago. In 13th century, the Danes came with a mission to spread Christianity and to convert the pagan Estonians. For a hundred years, the Danes ruled the country; and then sold the land to the Germans. At one point the region was divided between Baltic Danes and Baltic Germans. After the crusade in (1208-1227), present day Estonia and Latvia were called Terra Mariana, and later became known as Livonia. Tallinn was called Reval during the middle ages and was founded as the capital of Danish Estonia. In 1558, Russia invaded Livonia and the Livonia Order was defeated mercilessly. Since Livonia was a decentralised power with cities and serfdoms often fighting amongst themselves, after the defeat they sought foreign protection. During this time Reval and the Northern Estonia swore loyalty to the Swedish. After the Great Northern War, in which the Swedish lost miserably to the Russians, the Soviets began ruling Estonia and ruled there for 200 years. The last Russian troops left in 1994 and even today Estonia celebrates it as reindependence day. Estonia initially gained independence from the Soviet rule in 1918 when the Soviets were weakened due to the Bolshevik movement internally, and due to German victories in wars externally. Estonia declared independence during this time and was officially recognized as an independent country in 1920, and held fort for 22 years. During the second world war, Russia (Stalin) and Germany (Hitler) reached an agreement and the Soviets initially began by patrolling Estonia and soon the Estonians were forced to allow them access to build military bases in Estonia for the sake of defence. In the next few months, a complete military occupation of Estonia had happened. Few years later, the Nazis drove the Russians out and occupied Estonia for a few years building concentration camps and executing Estonian jews and gypsies and other non-Estonian communities. However, the Soviets reconquered again in 1944. Coming back to the present, old Tallinn is extremely beautiful with traces of Soviet, German, Danish and Swedish culture. Church religion isn’t as important as centuries of occupation has made them indifferent to religious beliefs. So people are Lutheran, Soviet orthodox, atheist/agnostic and also pagan. Many locals follow the earth religion and keep their pagan rituals and traditions alive. Many are just tree huggers with half of the country being forested. The old town square is gothic in style and was finished in 1404. The Estonian and the Tallinn flags soar high above the fort. A small statue of Vanatoomas (old thomas) is on the tip of the tower and shows the way the wind is blowing. Vanatoomas has occupied that position since 1530; though he is Vanatoomas the third. First one was destroyed in bombing and the second one by lightning. With this little secret, our wonderful guide Mairi ended the walking tour. While these tours are run for free by the tourist office, guides on doing this tour are students and volunteer to show their city around. It’s always good to leave a generous tip. I loitered around the old town square after the tour to soak in the beautiful Christmas market that was set up. 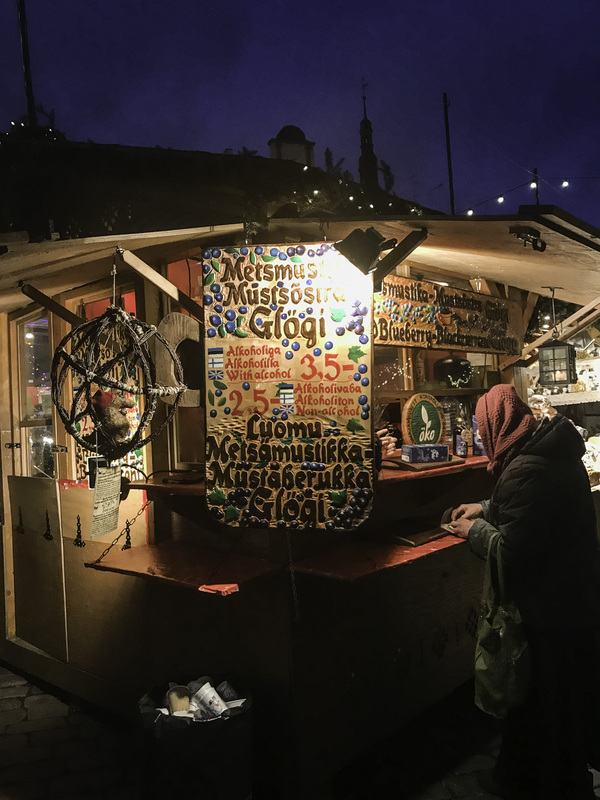 While Christmas was still three weeks away, Europe’s christmas markets are all bustling and festive. I grabbed some food, found an Indian restaurant and gulped down some chai (you can’t take the Indian away from a globetrotter). Winter Europe = photographer’s delight. The sun sets very early and the blue hour is to die for. I walked around photographing anything and everything. Tired after my arduous few hours of having fun with the camera, I walked over to the market to get something to drink, and made a new friend called Glogi. 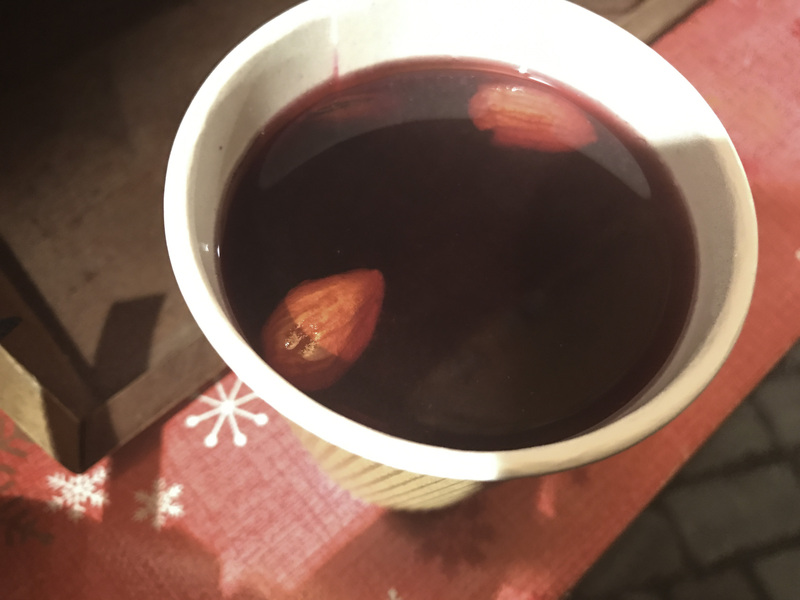 Glogi is a traditional Scandinavian drink made of blueberry juice, blackcurrant juice, spring water, sugar cane, cinnamon, nutmeg, cardamom, clove, and ginger. One may also had dark rum; which one did. One thinks it was the best decision to drink Glogi on that wonderful wintery evening in Tallinn. A gorgeous, friendly woman was selling this at the market who was kind enough to have a conversation with me. She is a vegetarian cook and hopes to start a full fledged blog one day, and I very certainly hope she not just starts one but it is also insanely successful. By this time, I was tired and headed back to the dorm. I had an early morning ferry back to Helsinki and needed to catch up with some sleep. When I reached the dorm, Taro, our dorm in charge, was warming dinner and having a conversation with one of the other guests in the dorm. I sat down, back in the comfort of a warm surrounding, and started talking to the girls sitting there, exchanging stories and listening. And just like that, a day in Tallinn had gone by. Storyteller. Ambivert. Feminist. Bibliophile. Solo Traveller. Dreamer. Photographer. Postcrosser. Samosa glutton. Potterhead. Cartwheel Queen. Bombay girl. FERÐASÖGUR is Icelandic for travel stories. Why Icelandic? Ever since I visited Iceland in 2016, my love for the country, its people, culture is unparalleled. This is a little tribute to the country that holds a special place in my heart.